In preparing for our move into the new house, I've already started pinning and shopping for things to help build up each room. 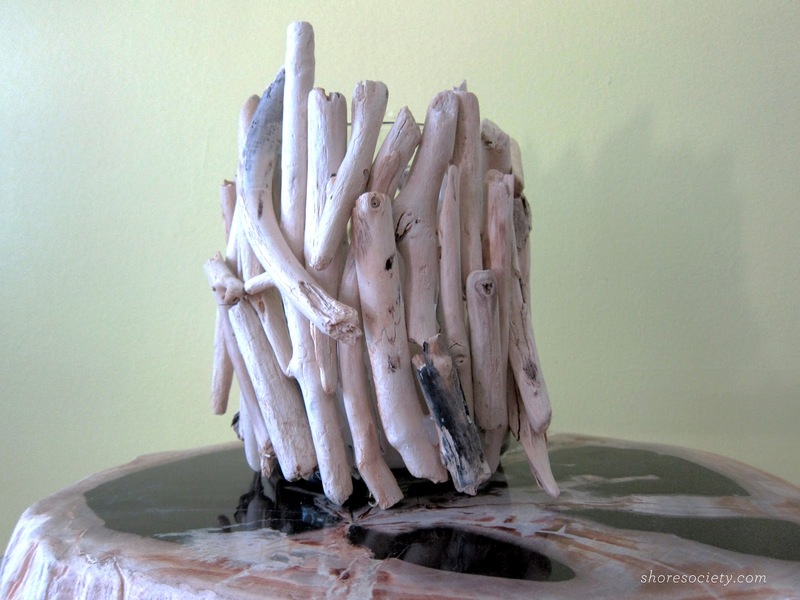 A few weeks ago, I ordered this amazing driftwood hurricane that was on sale at Anthropologie for $10. I thought it would look perfect in our living room with all of the other textures and neutrals I'm using, plus it's nautical and can I really say no to anything shore-related? The rest of my order shipped like normal, and I noticed the hurricane was missing from the box. To my dismay, I had an email waiting for me saying that they were no longer in stock, SORRY, do not pass go, do not collect two hundred dollars. Naturally I was upset, but it was time for plan B - DIY! I actually think it worked out for the best, I'm not only really happy with the result, but now I have TWO that are made with driftwood from our very own Lake Erie shore. Even better. And the cost was pretty similar, if not less since my wood was free—thank you, Great Lakes. 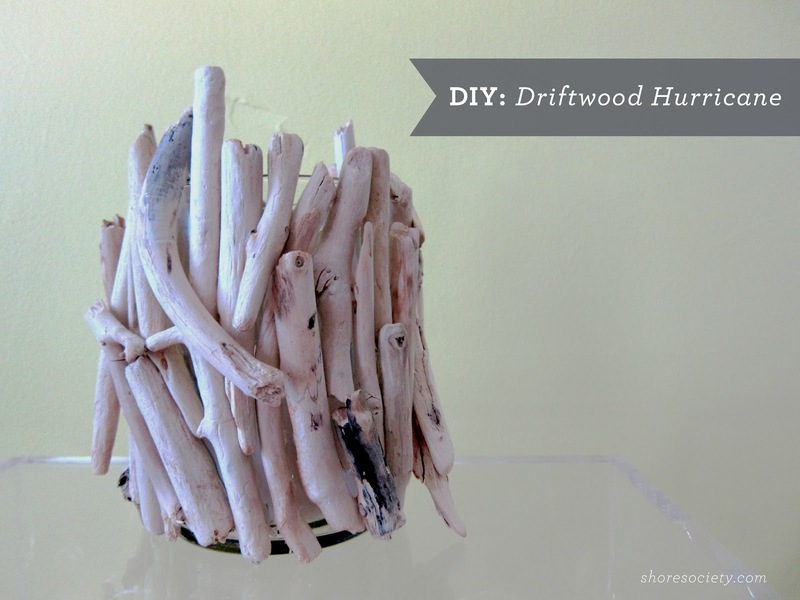 1) Gather your driftwood and place in a bucket. 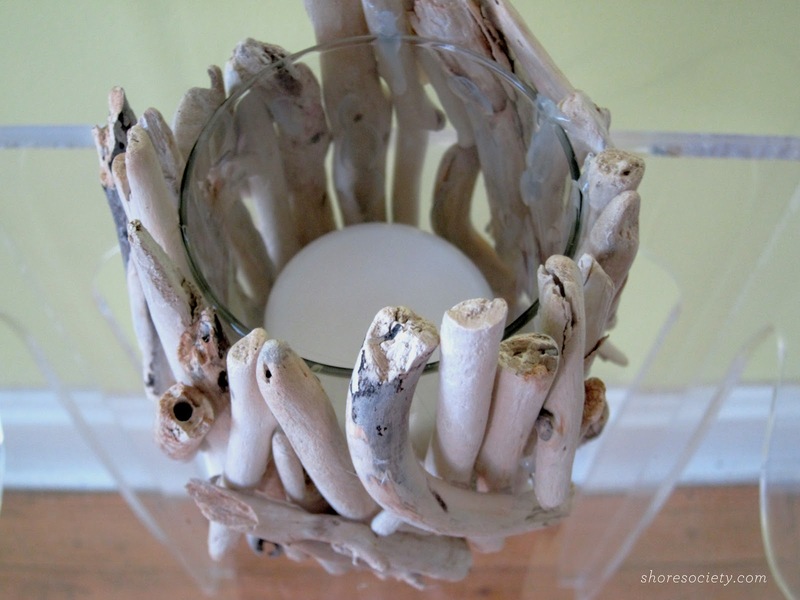 Fill the bucket with water (or use a strainer) and rinse the driftwood 3-4 times just to remove any sediment. Fill with water for a final time (so the driftwood is totally under water) and add 1/2 cup or so of bleach. Allow the wood to soak for 24 hours - this will kill any bacteria or creatures living in there - ew. Chances are the wood will lighten in color, so if you would like to retain more of the original color, use less bleach or shorten the amount of soaking time. I soaked mine for 24 hours and it lightened up to this nice sun-bleached color. 2) After the wood has soaked, rinse it, and lay out flat on newspaper to dry. You can leave it out on a porch or somewhere in the sun to make this go quicker. I let mine dry overnight and it was fine. 3) Now the fun starts - heat up your glue gun, and get to stickin'. You can glue the wood pieces in any manner you want, the more organic, the better. I set down a base layer to cover most of the candle holder, then layered some of the funkier/more textural pieces on top—this will create a nice depth. Try not to fill every little space, either, since the open spaces will allow the candlelight to escape. It's truly like putting a puzzle together. Just lay all your wood out in front of you and try different pieces until you get the design that you want. *Tip: Since the wood shapes are never straight/perfect, try lining the piece up before you adhere it, and only place glue where the wood will touch the glass. Chances are it's not going to glue perfectly flat on the glass. Hold it briefly until the glue cools so it stays in place. The nice thing about hot glue is that you can also almost use it to 'caulk' between pieces if they're not sticking quite right. View of the layers from the top. 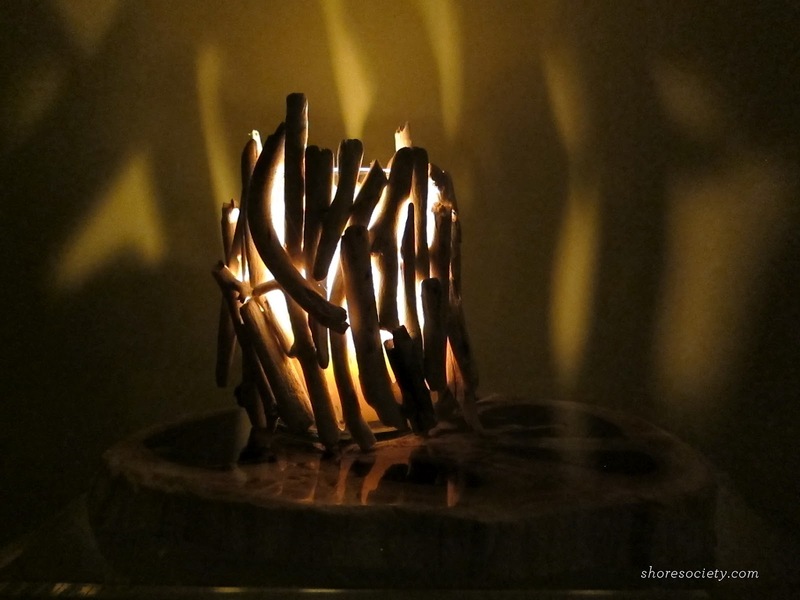 When lit, these set off such interesting shapes on the wall and give warmth to the room. I can't wait to light these as summer winds down into the fall. Plus, they look great unlit. This was such an easy DIY, I'm actually glad I ended up making my own, especially with the wealth of driftwood just laying around in our own backyard. Let me know if you guys try this, I would love to see pictures, as they all come out so differently!